The youngest parade marshal in Cleburne High School Homecoming history will lead Thursday’s Homecoming Parade. Coleman Elementary fourth grader Brody Nelson, who has captured the hearts of thousands with his valiant battle with cancer, has been chosen by the CHS Ex-Students Association Homecoming Committee to serve as 2018 Parade Marshal. Alumni recognitions also includes Wall of Fame Inductee James Wright, CHS Class of 1959 and Cleburne graduate Allyson Arnold House, who will preside over Homecoming festivities as Coming Home Queen. Thursday’s Homecoming Parade, set for 6 p.m., will follow the same route as in previous years, starting on Harlin Drive by the high school, heading east, before turning south on Woodard, passing behind Wheat Middle School. The parade will then turn north on Colonial, passing between Wheat and the high school before returning to the staging area within the Cleburne Bible Church parking lot. A map of the parade route can be viewed on the CISD website, c-isd.com. A community pep rally and the traditional bonfire will be held after the parade. This year, due to site conditions on the high school grounds caused by recent rains, the events will be staged in the field adjacent to Marti Elementary School, 2020 W. Kilpatrick (Hwy 4 West). “Awesome,” was the response from this year’s Parade Marshal, when asked about the opportunity to lead this year’s Homecoming cavalcade. Brody also views it as an early birthday present, as he will be turning 10 in October. Shaylynn McDonald, a member of the Ex-Students Association Homecoming Committee, said while it was a first to honor a Cleburne student, rather than a graduate, everyone involved is very pleased with the decision. Brody’s journey began in January, when a plum-sized tumor was removed from his brain in an eleven-hour surgery. This was followed by a series of radiation treatments. Teachers and fellow students at Coleman Elementary began wearing “Brody Strong” tshirts every Thursday to show their support for the student and his family, which includes father Ty, and sister, Emily, who attends Smith Middle School. When Cleburne High School Soccer Coach Christie Vick and the Lady Jackets learned about Brody’s battle, they joined the fight in hosting Brodie Strong Night. Jackets Baseball players and coaches took it a step farther, making Brody an honorary member of the varsity team. Brody’s battle has ultimately taken him to St. Jude Children’s Research Hospital for treatments, the most recent occurring over the summer. Through testing, the St. Jude staff discovered a mutation in the tumor that could be addressed by a new series known as TRK—or “Star Trek.” He will be involved in treatment over the next two years. After two rounds of treatment, the larger tumor is not of a measurable size—and the other tumors are gone. The soon-to-be ten-year-old is aware of the battle he is fighting--where he was and where he is going as the journey continues. The Coleman Colt will continue with his school work from home, working with a CISD teacher, while his chemo continues. But he isn’t “homebound” by any stretch. 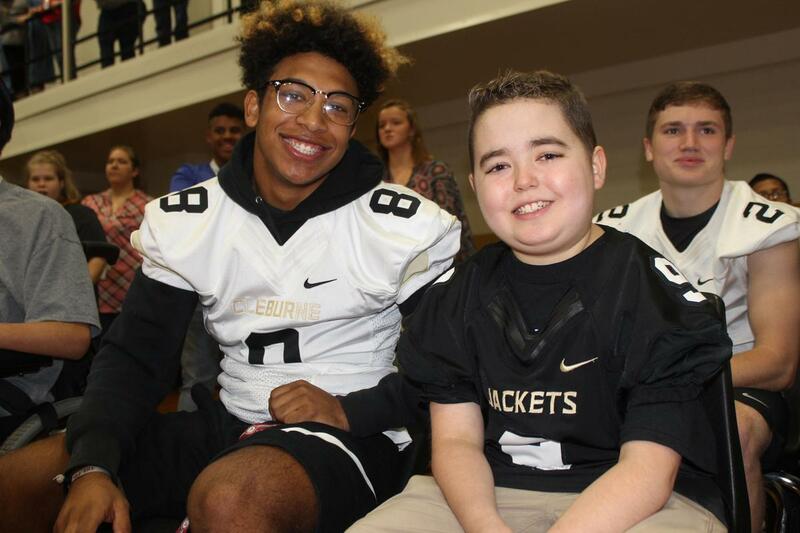 Brody had a front row seat with the Jackets football team at a recent pep rally, walking in with players during the school fight song. He is also busy advocating for St. Jude and what the facility does for young warriors battling cancer, and their families. Before, and even more so since he began his journey, Brody has chosen Christian music as a comfort in the hard times, and in the moments of joy and celebration. Brody Nelson, right, pictured with Wide Receiver Isaak Cunningham, was a special guest of the Jackets at the last Cleburne High School pep rally. The Cleburne fourth grader has been named the 2018 Homecoming Parade Marshal by the CHS Ex-Students Association.